It’s easy to set up Apache as a reverse proxy server that caches content. Below is a guide detailing how this can be done on an Ubuntu 16.04 host. Following these steps, I was able to stand up a quick caching layer in front of an app server, greatly reducing its load by caching web mapping tiles that were expensive to generate. If any of these modules are not available, try installing the apache2-utils package. Enable Apache’s caching module by specifying a caching provider and the URL path to be cached. The directives below instruct Apache to cache all requests to disk in the CacheRoot directory. Next are several common configuration items such as disabling the CacheQuickHandler, specifying a CacheLock, and enabling a header that marks requests as HITs or MISSes. For more information, please see the mod_cache manual (which is actually incredibly helpful for a man page). While there are many ways to do it, this example uses Apache’s mod_expires to generate and set the “Cache-Control” and “Expires” headers for proxyied requests3. ExpiresByType text/html "access plus 1 years"
Setting up the reverse proxy is simple, and requires adding 3 lines to the Apache config. These lines specify which requests will be proxied, and what server the requests will be proxied to. The complete Apache vhost file is shown below; each area is optional, and can be configured to more closely match the Apache proxy’s true operating environment. 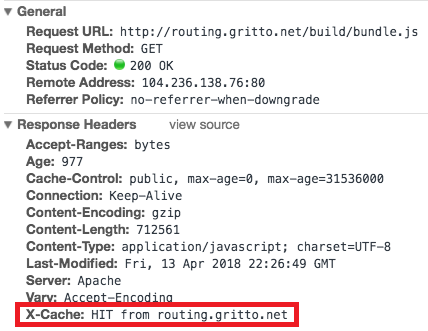 With the caching server in place, inspect the headers on a request as it is returned to the browser; seeing an X-Cache header with a value of “HIT” means the content was returned from cache. A “MISS” means the content had to be retrieved from the upstream server. The first request is almost always a “MISS”, and is what triggers the cache to populate. Also remember that the browser may be sending a “Cache-Control: no-cache” header. If this is the case, make sure CacheIgnoreCacheControl directive discussed above is enabled.